Whenever English Premier League teams are playing and especially Arsenal, Manchester United or Chelsea Mathare Valley is always abuzz with activity be it in the evening or late at night. The game between Manchester United and Chelsea was televised at 10.45 pm on Tuesday. This is late but one will be surprised to see how many people stayed late to watch the match. In Mathare Valley there very Video/Movie joints which are cashing on the popularity of soccer in England. I decided to find out why people rarely follow up on our local football scene. First our people know very little about Kenyan soccer players apart from Dennis Oliech of Auxerre and Francis Kimanzi former coach of Mathare United. From our discussion, it was evident that the sports journalists in the English Premier League look at player in totality. English sport journalists they not only concentrate on playing alone but they also share with you players’ family background and social life. The Kenyan sport journalists rarely tell us what our players eat, which discos they go to, their girlfriends, or even which political parties they like or they support given that people here are more interested in politics than anything else. Our sports commentators are very boring while the English Premier League journalists are very entertaining and full of drama. Watching the English Premier League one likes both the playing and comments from the commentators. If Arsenal or Manchester United were to visit Kenya today, they will be shocked by how many supporters they have in the slums. When Arsenal is playing Manchester United some people cry while others lose money after betting. Maybe it is high time that the Super Sports offered extra funding to our sport journalist and commentators and enhance their capacity to take our sport to a high level. This will help attract more people and sponsors. When it comes to soccer Mathare Valley can boast of being the only slum in Kenya to have ever produced national coaches for senior and junior teams. This is apart from grooming some of the best soccer players such as the Mulama brothers. Former Harambee Star coach, Francis Kimanzi was born and brought up in Mathare Mlango Kubwa area while Gabriel Njoroge from Mathare Village 2 became the national coach for Kenya U23 soccer team. Their prowess in soccer skills is a testimony of untapped talent that lies in most slums in the world. However you will be shocked to learn that no ground has been improved to nurture untapped talent in the slum of Mathare. In Mlango Kubwa, youths depend on the St. Teresa’s Girls Secondary while in Mathare Village 2 where Gabriel Njoroge popularly known as Kingi grew up young soccer players use the Mathari Police Depot grounds. The next ground if found next to Kiboro Primary School, which is referred to as Austin Ground, which is only half size of a normal pitch. In Huruma, we have Huruma Stadium which hosts most of the soccer tournaments in Starehe Constituency. 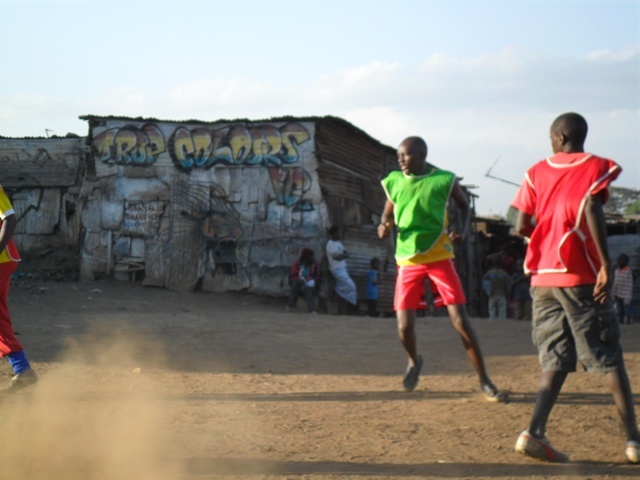 But what makes soccer the most popular sports in the Mathare? Soccer has always been used by politicians to secure votes among the youthful population within Mathare. As we approach elections in 2012, youth will be preparing to attract politician. Soccer is used as crowd puller. NGOs have also used the sport to attract or educate the youth about substance abuse and created awareness on HIV/AIDS. Local communities have been forced to utilize limited space available to their advantage. 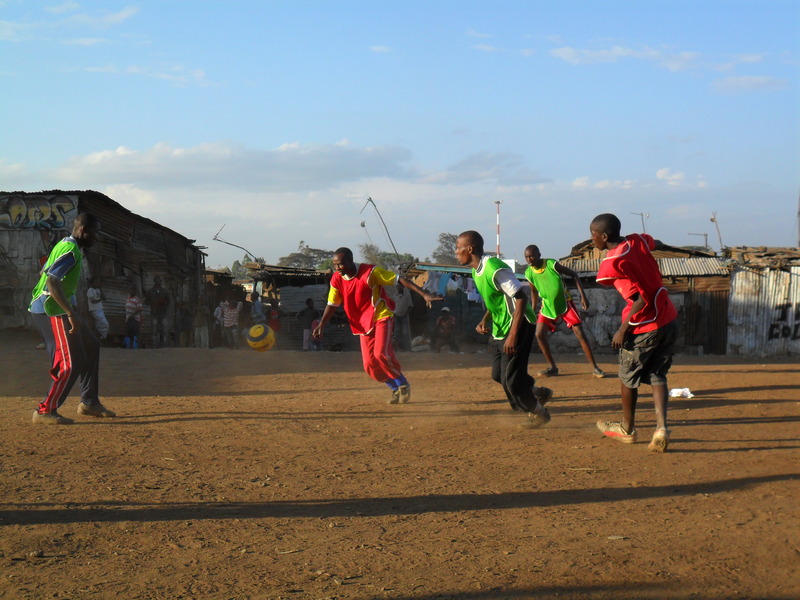 In Huruma, some parking and open spaces are used by children to play soccer or any sport. In Mathare soccer is the biggest crowd puller more than any other sports. Most slums are associated with limited spaces available to host various sports. This is due to over-crowding and unplanned nature of houses. The situation is the same in Mathare. Right from Mlango Kubwa to Mathare North and Huruma the situation is that of limited space for sports. The available spaces shared between sports and regular public gatherings which includes political and religious rallies. However, there are various fields that are used for sporting activities. Within the slums, the most common sports include, boxing, soccer, darts, draughts, swimming, Ajua, pool, athletics, Volleyball and soccer on the DSTv channel. Every week, starting this Friday-14/1/2011, we shall highlight each sport accompanied with photos. Watch out for more…on this space.